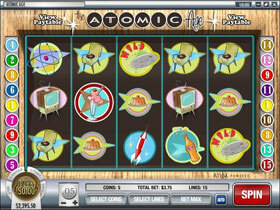 Atomic Age is an appealing 5 reel video slot with 15 paylines and contains a 1950's theme. 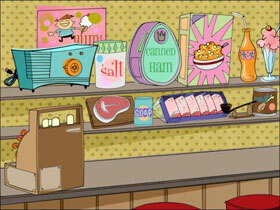 Players get the feel of the luxurious times that this era held through the icons that are depicted in this game such as the UFO, Cashier, Rocket and an Atom, which is the Wild in this game. The two Scatter icons are symbolised by the Cashier and the Drive-In icons. Included in this exciting video slot are two Bonus rounds, which will be activated activated when three Cashier icons show up on the reels. In The Drive-In Bonus feature, players need to choose the correct winning combination, which is a person, a date and film. In The Cashier Bonus Feature, players need to hit a minimum of three Cashier icons to start playing. Both these Bonus Features can be enjoyed by all types of gamblers. The careful players can wager bets for as little as $0.15 per spin and the big gamblers can wager up to $18.75 per spin. Players can win huge sums of money in these two Bonus Rounds which makes it a very appealing game. 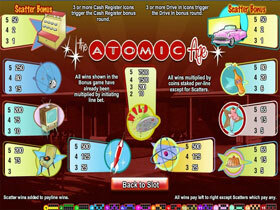 Atomic Age video slot does not contain multipliers or Free Spins. There is a Jackpot worth 8000 Coins which works out to be $37,500. The high quality graphics and ambiance will guarantee players an exciting gaming experience!